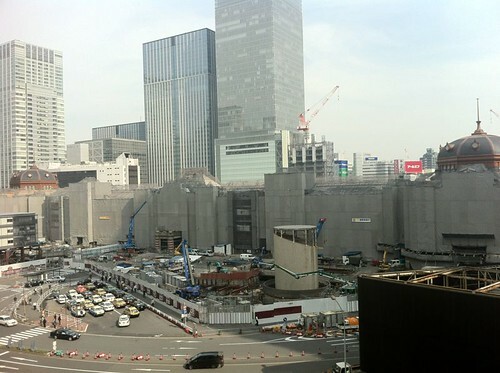 Still scheduled to be completed this year, the renovation work on the Marunouchi side of Tokyo Station is still under way. The new domes over the North and South entrances can now be seen popping up from the scaffolding surrounding the building. For as long as I have known it, Tokyo Station has been an underground building. The Marunouchi side was a quick post war knock off of the original building and has for all intents and purpose been a condemned building for years. This new renovation is supposed to return the building to its pre war original state. I'm dreaming of a new, but classic design that will add visibility and access to the tracks and bring ye station out of its underground cocoon. Tokyo needs a signature station like Grand Central in New York or Moscow subway station. Hopefully we'll get a chance to see this landmark rise again in a few months.